‘Sky Puddles’ is my art installation currently exhibited at Berie Grants Arts Centre, London. This site-specific installation in the courtyard invites you to engage with the sky. Sky Puddles is Carolina Khouri’s site-specific installation which provides viewers with an opportunity to examine the shift between reality and representation. 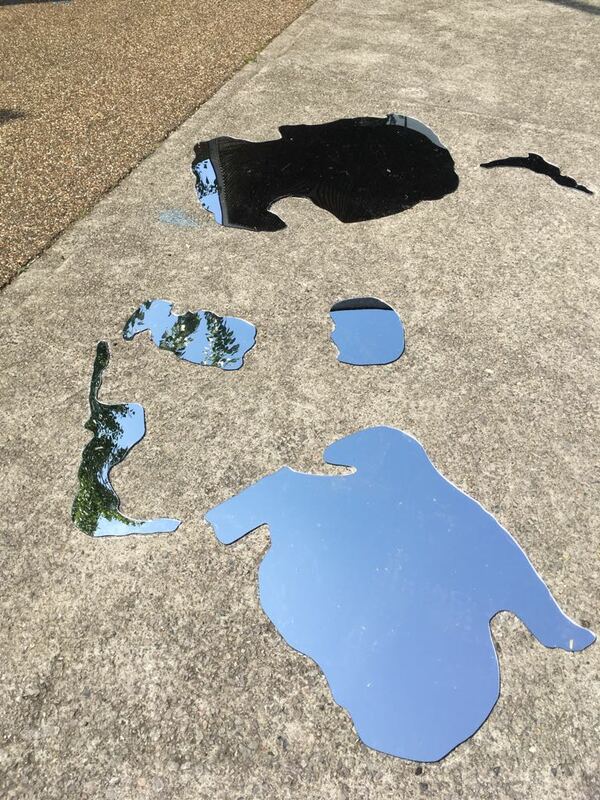 Mirrors, placed on the ground in the Bernie Grant Arts Centre’s courtyard, fracture an uninterrupted surface and create a fascinating perceptual adventure. Ever-changing sky and weather overhead engage viewers with their own images. In this way, people and the surroundings become part of the artwork. The use of mirrors makes it possible to express the idea of ‘reflection’ as a process and the way of understanding our individual relationship with the world around us. The installation actively reorganises our perceptions and calls attention to the sky. The shape of puddles are inspired by constantly changing natural and weather conditions. The appearance of puddles on a rainy day, their glistening in the sun, reflecting the sky overhead, their evaporation – all those elements show the continuous movement of matter, of which we are a part.